I’m not sure what this word says, but I hope it’s something nice. At least, it’s what we can wish. Based on a true story. The scent of curry wafted sweetly to my olfactory senses, as I opened the cabinet door upon my kitchen spice shelf. There was no choice but to combine these bowties I’d planned to make kasha with, a Jewish dish of buckwheat, toasted in a coating of egg wash, mixed with cooked bowtie-shaped pasta (gentlemanly, to note the least) with the curry. What else? Penne, by any other name, would have seemed no substitute. 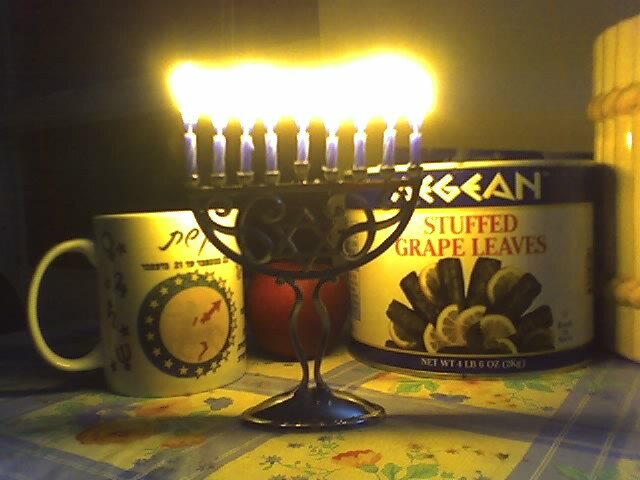 I could’ve used some of the remaining coconut I’d toasted for my Chanukah latkes, but that thought didn’t cross my mind. Instead, I selected the trusty standby, peanut butter (thank-you, peanut butter), and my newest purchase, Ponzu. What was I thinking? What was I going to do with this ponzu? And why did my fingers type the beginning of two mysterious letters not even that close to each other on the keyboard as if it should shout? H A P P Y C H A N U K A H ! ! !